While 2015 was an overall success for the biotech behemoth, not all of the news was positive. It was a great year to be an investor in biotech giant Regeneron Pharmaceuticals (NASDAQ:REGN). The company put up impressive growth numbers all year long and managed to score several major regulatory wins during the year that combined to propel its stock 30% higher. While the news flow related to the company was nearly universally positive, there were still a handful of negative developments that investors need to be aware of. Regeneron Pharmaceuticals has been a Wall Street darling for years, with its strong track record of blowing past analyst profit expectations. However, the company proved to be mortal during its first quarterly earnings report of the year, when its $2.79 of earnings per share came in a bit below the $2.82 Wall Street was expecting. Shares briefly dipped on the miss, but they recovered quickly and ended the week higher than they started. Long-term investors still had plenty to cheer in the release, given that revenue and profits both jumped by double digits, but it was still a downbeat way to start the year. Shares plunged after news broke that a panel of outside advisors to the FDA recommended approving Praluent, the company's new cholesterol-lowering medication. What shook investors was the vote tally, with 13 on the panel voting in favor but three voting against. The reason given for the three negative votes was the lack of long-term outcomes data for the drug. Specifically, some panel members openly questioned the idea that lowering LDL cholesterol would lead to a lower risk of cardiovascular disease. Regeneron and its partner, Sanofi (NASDAQ:SNY), are currently running long-term trials to test Praluent's ability to lower the risk of cardiovascular disease, but those results won't be on hand until 2017. Those fears proved to be overblown, as a few months later Praluent did win regulatory approval in the both the U.S. and Europe. Still, those "no" votes gave traders a reasons to be cautious. Regeneron and Amgen (NASDAQ:AMGN) were in a heated race to bring the first PCKS9 inhibitor to the market, and on July 21, Amgen won. The European Union announced that it had approved the sale of Repatha, Amgen's PSCK9 inhibitor, which will compete head-to-head with Praulent. Regeneron and Sanofi would be vindicated a few days later, when they received word that Praulent would be the first PCSK9 inhibitor approved in the U.S., but it still must have stung a bit to see Amgen reach the finish line first. Roughly a month after the FDA approval of Praulent, Amgen once again spoiled the fun, announcing that Repatha had won FDA approval as well. With both companies now boasting regulatory approval of their new PCSK9 inhibitors, the race was on to see which company could win the insurance-coverage battle. It appears the companies aren't interested in competing on price alone, as they each priced their products at just over $14,100 per year. Both companies were making progress on getting their products covered by many of the nation's largest carriers, but Amgen scored a huge victory when it announced that CVS Health had granted Repatha an exclusive position on its formulary. News that CVS Health was forcing patients to use one drug over another surprised some investors. CVS Health's chief medical officer, Troyen A. Brennansaid, offered an explanation: "We have determined that choosing a single PCSK9 inhibitor for our commercial formularies allows us to get the best price possible for clients and preserves our commitment to deliver the best care available." To that end, Amgen was very aggressive on its pricing for Repatha and even agreed to tie the price of the drug to its effectiveness. This news could prove to be a major negative for Regeneron and Sanofi going forward. Since CVS Health is one of the nation's largest pharmacy benefit managers, this deal could block millions of Americans from using Praulent. 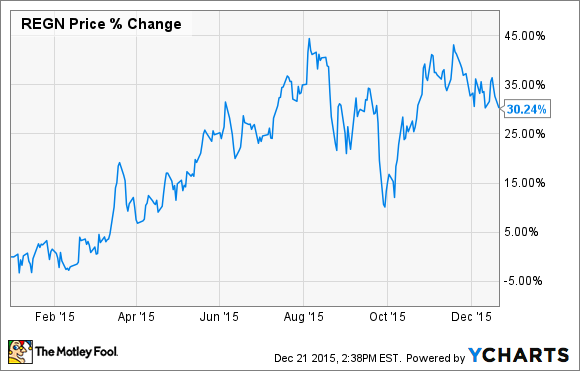 I just spent a whole article talking about the negatives, but frankly 2015 was a pretty darn good year for Regeneron. And if you're an investor in Regeneron Pharmaceuticals, don't let these few negative headlines get you down. There was plenty of positive news during the year that sets the company up to hopefully have a wonderful 2016.